Recipes of traditional sweets dressed with syrup. 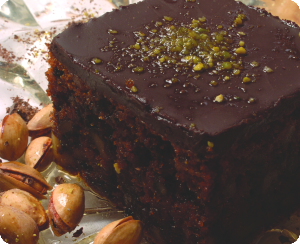 A sweet made of crusts and stuffing of nuts, usually walnuts. A crust that is unforgettably crispy, despite the fact that it is filled with sugar syrup and honey It fits awesome with a cup of Greek coffee. ½ cup of lemon juice Preparation: We spread the crusts two by two on the pan in such a way so as to adapt to the size of the pan. Next, we anoint some butter. We repeat this process until we reach the 1/3 of the crusts we got. We pour the first bed of nuts. We repeat the same procedure with the remaining 1/3 of the crusts, by dropping the rest of the nuts. We continue with the remaining crusts, by applying a sufficient amount of butter onto them. We cut “baklava” into pieces of our taste. We then preheat the oven. We finally bake the sweet in 180C for 50 minutes approximately. Syrup preparation: We add water, sugar and glucose in a pot and boil them over low heat. Once the syrup boils, we will add the lemon juice into the pot and stir. We will boil it until it is thick enough. Syrup Dressing: The time “baklava” is ready and out of the oven, we dress it with hot syrup. After waiting for about an hour until it is ready, we serve. Not only the crunchy crusts but also the “kantaifi” and nuts are set to make “baklava” a surprise when they’re combined with its great cream. ½ cup lemon juice Preparation: We need a pan of 45 x 30 cm. We spread the crusts two by two on the pan in such a way so as to adapt to the size of the pan. Next, we anoint some butter. We repeat this process until we reach the half of the crusts we got. Next, we spread the nuts and “kantaifi” (only after we have spread it), buttering them slightly and then place the remaining flakes while buttering them simultaneously. Once this process ends, we add the remaining butter. Right after we score the sweet into squares or triangles. Then we preheat the oven and bake at 180C for 1 hour and 15 minutes. Syrup preparation: In a pot, we add water, sugar and glucose and boil them over low heat. Once the syrup boils, we add the lemon juice into the pot and stir. We will boil it until it is thick. Syrup Dressing: The moment “baklava with whipped cream” is ready and out of the oven, we immediately dress it with the hot syrup. We then wait for 2 hours for the sweet to be ready, and place it in the fridge for 1 hour. When we get the sweet out of the fridge, we remove one by one the pieces from the pan and place them on a tray. We take a knife and cut the spot where the stuffing is, in the middle of the sweet in a horizontal axis, and by this way we divide it into two pieces. We place whipped cream between the two pieces. We continue by covering the whole sweet with whipped cream. We sprinkle the mashed pistachio kernels on the top and the sides, decorating the spots where there is whipped cream. We can go on with the same process for all of the parts of our sweet. A fine eastern dessert with nuts, sugar, cinnamon, and clove, which is wrapped in “kantaifi” flakes with delicious syrup for dressing. ½ cup lemon juice Preparation: We need a pan of 45 x 30 cm. We rub “kantaifi” flakes with our hands, so as to spread its “hair”. Then we soak the kantaifi flakes and put it aside for five minutes. We create parts at about the size of our palm with “kantaifi” flakes and place them on the table. Then we fill each piece with walnuts. After this process has been completed, we wrap each piece in a roll, placing them into the pan next to each other, as tighter as possible. After we have filled the pan, we melt the butter and sprinkle with a brush each piece. Then we preheat the oven and bake the sweet at 180C for 1 hour. Syrup preparation: In a pot, we add water, sugar and glucose and boil them over low heat. Once the syrup boils, we add the lemon juice into the pot and stir. Then we boil until it is quite thick. Syrup Dressing: We must wait until the sweet is cool enough and then pour the warm syrup in the pan. We wait for about an hour until it is ready to be served. A “kantaifi” wrapped in baklava crust slightly dressed with syrup. For pleasure seekers! ½ cup lemon juice Preparation: We spread the crusts. We take two crusts and spread in their center “kantaifi” and throughout their length and anoint with some butter. We also spread the walnuts and wrap the crust in such a way that it becomes a roll. After finishing with the rolls, we cut each roll into 12-15 cm pieces. Then we place them in the pan either in a horizontal or a vertical axis. After filling the pan, we sprinkle with some butter the remaining pieces one by one, so as to cover all the pieces sufficiently. We then preheat the oven and bake the sweet at 180C for 1 hour and 5 minutes. Syrup preparation: In a pot, we add water, sugar and glucose and boil them over low heat. Once the syrup boils, we add the lemon juice into the pot and stir. Then boil until it is quite thick. Small sweet filled with syrup made of crust and flavored syrup in a cylindrical shape. ½ cup lemon juice Preparation: It would be useful to have a very thin rod (of metal or wood) for a perfect result. We pour a small amount of flour on our workbench. We can take the crusts one by one and wrap them around the rod, in order to create a roll. You remove the rolls from the rod and dip them in flour, so as to be covered well throughout their whole length. Then we cut the rolls into small pieces of about 2 cm. Then we place them into a sieve until the big amount of flour is gone. In a frying pan we put a lot of oil and heat it well. We place the pieces inside the pan and leave them until they have a golden brown color. Syrup Dressing: Once the “kourkoumpinia” are ready, we drain them well and add them to the syrup, which should be cold. We let them be soaked for about an hour. Serving: “kourkoumpinia” usually are served with cinnamon. The most popular traditional sweet with fluffy cream covered by fine semolina, crusts with plenty of fresh butter dipped in cinnamon syrup. In a pot, we add milk and the half amount of sugar and then boil them. In a second pot, we add the eggs, the remaining sugar and the semolina. When the mixture of the first pot boils, we add it in the second pot in a slow way, we stir the mixture so that it is assimilated. We put the pot back on the heat until the mixture boils again. We then let cream cool. Flakes preparation: you need a pan of 45 x 30 cm. Anoint with some butter the pan sufficiently. We lay the flakes so that they will take a folder shape, in such a way that in each side of the pan the half of the crusts will protrude. At the same time we anoint with butter each flake and go on with this process until we reach the half amount of the crusts. We then add all the cream into the pan. We apply it across the whole pan evenly. After this we wrap the crusts one by one sequentially, towards the inside of the pan, buttering, again, the crusts. Once we finish this process we add the remaining crusts, this time, on the size of the pan. We apply the remaining butter and then we score it into four lines in the big size of the pan. Then, we preheat the oven and bake at 180C for 1 hour and 5 minutes. Syrup Dressing: When we take the “galaktompoureko” out of the oven, we drain the excess butter remaining in the pan. Right after, we pour hot syrup to the sweet. We wait for about an hour until it is ready to be served. 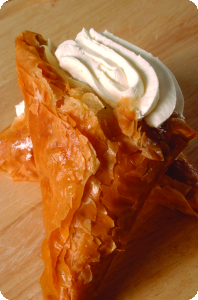 Triangular-shaped temptations with rich fluffy butter cream wrapped in delicious crisp crust. Could you ask for more? ½ cup lemon juice Crust Preparation:We take a square-shaped crust and fold it in half. We anoint it with butter. We take one side of the crust and fold it to the opposite side, forming a triangle, like a wipe. We follow the same process sequentially. Syrup preparation: In a pot, we add water, sugar and glucose and boil them over low heat. Once the syrup boils, we add the lemon juice into the pot and stir. Then boil it until it is thick. Syrup Dressing: When “trigona” are cool enough, we dip them in the syrup, which should be warm. Then leave “trigona” in a strainer, so as to be drained thoroughly. Cream Preparation: We place in a pot some bovine milk along with sugar. In another pot we mix the eggs and flour with a little cold milk until they’re assimilated. We pour them into the pot while they are warm. We boil the mixture by simultaneously stirring it until all its ingredients are assimilated. We take the triangles one by one and score them a point to the spot that are more inflated. Then, we very carefully clean them in the inside. We fill with cream the inside of the scored “trigona”. We place them on a tray or a platter and garnish with whipped cream to the spot where there is cream. Whipped cream Preparation: We blend in a mixer the cream with icing-sugar until it is quite thick. Then we add the half amount of whipped cream into the pan with cream and stir. Fluffy dough with eggs and some light syrup. In the middle of the sweet there is pure whipped cream and cherry with nuts on the top. ½ cup lemon juice Dough Preparation: We all the ingredients until they are assimilated. We add water as much as it gets the dough until it is elastic (try by hand, the dough should not be sticky). We put aside the mixture for about one quarter. We take ramekins of our taste and fill them. We then preheat the oven and bake them at 180-200C for 15 minutes. We let “babadakia” cool, and later we cut them one by one sequentially in a horizontal axis in their middle, creating a cap. Syrup Preparation: In a pot, we add water, sugar and glucose and boil them over low heat. Once the syrup boils, we add the lemon juice into the pot and stir. Then boil until it is quite thick. Syrup Dressing: Wait until the sweet is cool and pour the pieces it in hot syrup one by one. Place them on a platter so as to be drained. Once we have filled “babadakia” with syrup and they are cool, we apply on their surface any jam. Then we fill the inner of “babadakia” with whipped cream and garnish over its “cap”. Whipped cream Preparation: We blend in a mixer the cream with the icing-sugar until it is quite thick and then we put it in the fridge. The chopped walnuts, cloves, nutmeg and the cinnamon, will take you back to rare flavors and periods of time, when people used to enjoy the sweetness of the syrups. Embraced with thick chocolate!!! ½ Teaspoon Vanilla Procedure: We place in a pot, sugar-icing, cinnamon and baking powder, the yolks, butter and brandy and stir until they are assimilated. We add the grated pound cake, nuts and finally the white of the eggs, which we have already hit it in the mixer so as to form meringue. We stir well. We oil the pan which is going to be used and then we pour the mixture into it. We preheat oven and bake at 190oC for 50 minutes approximately. Syrup Preparation: In a pot, we add water, sugar and glucose and boil them over low heat. Then boil until it is quite thick. Syrup preparation: Wait until the sweet is cool and pour on it fresh syrup, while it is still warm. Chocolate Preparation: We make chocolate sauce with dark chocolate and evaporated milk. We heat the milk and after removing it from the fire, step by step we add the chocolate to be assimilated into the milk. We then pour the chocolate sauce in the pan. We spread evenly the surface of the sweet is covered totally. Eggs, some flour, vanilla syrup in a delicious combination. ½ cup lemon juice Preparation: you need a pan of 45 x 30 cm. We pour into a pot the eggs, then, we add sugar and ½ cup of water. We stir them with a wire to assimilate them and then we mix them by adding the flour little by little, for 20 minutes, until the mixture is fluffy. We oil the pan slightly with a brush and then pour the mixture. Later, we preheat the oven and bake at 180C for about 50 minutes. Syrup preparation: In a pot, we add water, sugar and glucose and boil them over low heat. Once the syrup boils, we add the lemon juice into the pot and stir. Then boil it until it is quite thick. Syrup Preparation: After “revani” is baked, we remove it from the oven, score it circumferentially the pan and wait for it to cool. Once the sweet is cool enough, we cut it into small or large pieces. Then we add the warm syrup uniformly to be absorbed. Right after, we wait for about an hour until it is ready to be served. Original cream of buffalo milk is combined with a fabulous delicious “touloumpa” which can be found in Chatzis patisserie exclusively. Fresh “kaimaki” Preparation: We mix flour with sunflower oil, salt and water until all the ingredients are assimilated. We put the dough in a mixer, adding one by one the eggs, and go on with mixing them. After we have finished with the mixing, we put the dough aside on the workbench and work the dough by hand, then let it rest for 10 minutes. After this, we get a topping bag or a hand press for “touloumpa”, with the biggest spout and fill it. Frying Preparation: We fill a frying pan with a lot of oil and heat it well. With the topping bag we start pressing the dough right above the pan, so as for the dough to fall directly into the hot oil. We fry until our pieces are brown. Syrup Dressing: Once they are ready to come out of the pan, we pour immediately the syrup on “touloumpa”, which should be cold, and let them soak for several hours. We garnish them with cream of buffalo milk.